There were a few holidays where I would literally stay up all night baking to meet orders due to be picked up the next day. Easter was one of those holidays. I had countless orders for hot cross buns. If you’ve never tried these rolls, you’re missing something! The recipe is below, followed by a video demonstrating how I make them. In a saucepan, heat milk, water and butter to 120-130°F. Meanwhile, place flour, sugar, yeast, salt, lemon peel and nutmeg in a mixer bowl; combine dry ingredients. Add warmed liquid mixture and eggs to flour mixture. Stir to combine ingredients. Add currants and chopped dried pineapple. Mix with stand mixer (or hand knead) on low to medium-low speed for 8 to 10 minutes until dough is smooth and elastic. Scrape sides of bowl, coat dough with nonstick spray, cover and allow to rest for 10 minutes. On a lightly floured board, with a knife, cut dough into 12 equal size pieces. 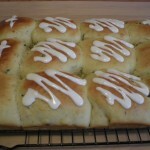 Roll dough pieces into balls and place them in a greased 9×13″ baking pan. Place on the rack in the middle of an oven that was warmed by only the light bulb and a pan of boiling water placed on the bottom rack (or cover the pan and allow the buns to rise in a warm place of choice). Allow buns to rise for about 30 minutes, until doubled in size. Brush rolls with a mixture of one beaten egg white and 2 tablespoons of water. Bake at 350°F for 15 to 18 minutes, until lightly browned. Remove to a wire rack to cool. Pipe a cross on each bun with vanilla glaze. Combine glaze ingredients in a small bowl, adding only a small amount of milk at a time. Add enough milk to make it a piping consistency. Adjust consistency if needed by adding more milk (if too thick) or powdered sugar (if too thin). Place in a piping bag with a small round tip and pipe a cross (or other design, if desired) onto buns. 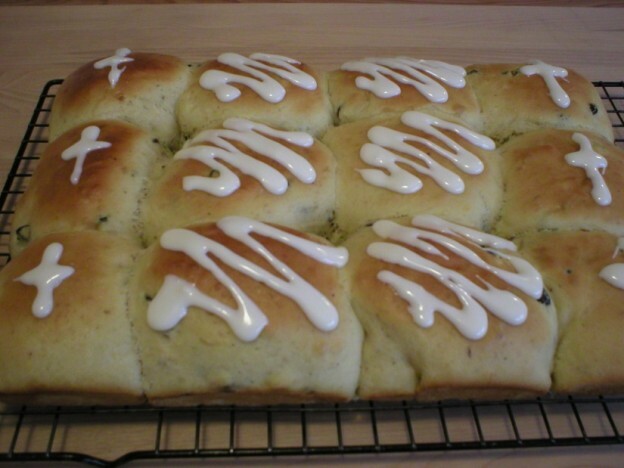 This entry was posted in Food, Yeast Breads and tagged Easter recipes, hot cross buns, sweet roll bun recipes on February 8, 2016 by Judi.